Beginning in the late 1980s, some states turned to private, for-profit companies to operate their prisons in hopes of controlling costs. As Alabama contemplates prison expansion, state officials may be tempted to follow suit in a misguided effort to cut costs. At least one major prison company – GEO Group – has already established a foothold in Alabama by buying a re-entry facility in Columbiana and a vacant building in Perry County. Private prisons, however, are not the answer. Focused solely on their bottom line, private prisons cut costs wherever possible. While these shortcuts raise profits for the corporations that run these facilities, they don’t necessarily save taxpayers any money – nor do private prisons absolve the state of its responsibility to ensure a constitutional level of care and living conditions to those incarcerated. In fact, the most up-to-date research finds that private prisons cost more than their public counterparts, while having fewer rehabilitative services, inadequately trained corrections officers and remarkably high staff turnover. In recent years, many states have ended their contracts with such companies, realizing that the long- term cost savings originally promised were largely illusory. Between 1999 and 2010, nine states eliminated their reliance on private prison companies. In addition, Wisconsin has reduced the number of prisoners in private facilities from thousands to dozens. The Federal Bureau of Prisons announced in late 2016 that it would follow suit by phasing out its use of private prisons in light of findings that the facilities aren’t as safe and effective as government-operated prisons a reform that was reversed only with the changing of administrations in 2017, not the discovery of new evidence buoying the case for such facilities. Alabama should heed the hard lesson other states have already learned: Private prisons are not the solution. 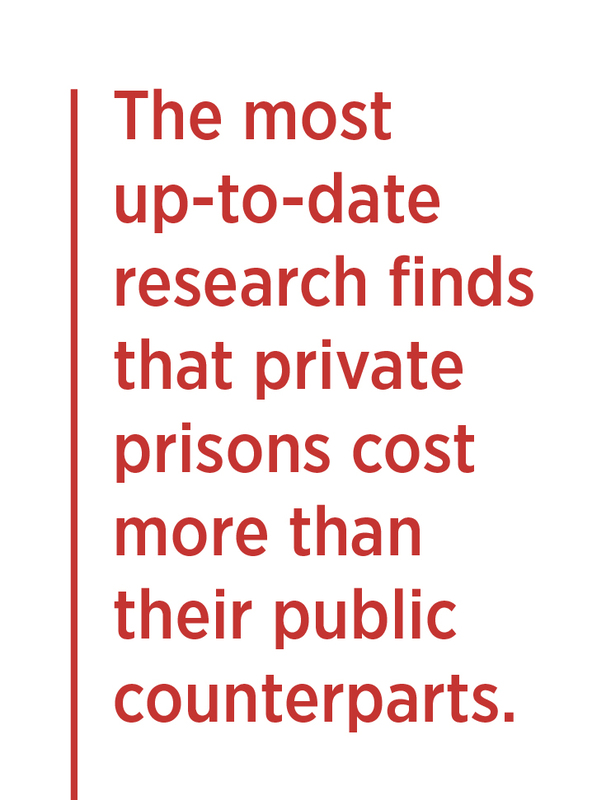 Despite cost-saving claims made by proponents of prison privatization, there are no independent studies that suggest private prisons are more cost-effective than state facilities. And that only makes sense. How could a private company possibly operate an Alabama prison more economically than the state already does — without sacrificing safety of rehabilitative programs — while still providing overhead costs and returning profit to shareholders? In the most comprehensive analysis of the costs associated with prison privatization to date, researchers at the University of Utah found that private facilities provide "neither a clear advantage nor disadvantage compared to publically managed prisons." Public facilities slightly outpreformed their private counterparts in terms of skills training and the number of grievances reported by prisoners.. Moves toward privatization, the researchers concluded, were "questionable." Private prisons can sometimes appear to cost less than public facilities because private operators favor low- and medium-security prisons that are cheaper to run than maximum-security facilities, where aging prisoners who are more costly to house and treat are incarcerated. But when the differences between populations and practices are taken into account, state-level studies suggest private facilities cost more than public prisons. In a 2014 survey of state-level cost analyses, the research and policy group In the Public Interest found that the cost of private facilities exceeded the cost of publicly operated counterparts in Arizona, Florida, Georgia, New Mexico, and Ohio. In New Mexico, for instance, annual spending on private prisons increased by 57 percent between 2001 and 2006, despite the only 21 percent increase in the prison population. Most of the increase was due to automatic price increases included in private prison contracts with the state. In Arizona, prisoners in private facilities each cost up to $1,600 more per year than those housed in public prisons – even though private prisons handpicked the healthiest, and therefore least costly, prisoners. Private prisons have been found to hold people longer than state-run facilities. In a Mississippi study, prisoners in private facilities spent an average of 60 to 90 days longer behind bars than prisoners in state-operated facilities – at an additional cost of at least $3,000 per prisoner. That’s because prisoners in private facilities received twice as many conduct violations, which were used by the state parole board to assess whether they should be granted early release. Through campaign contributions and lobbying, the private prison industry has also quietly supported laws that place more people in prison and subject them to harsher sentences – changes that offer no rehabilitative value and increase the burden on taxpayers. Reports document the industry’s support of Arizona’s controversial “show me your papers” anti-immigration law, as well as legislation that mandates harsher punishments for drug offenders. Indeed, CoreCivic (formerly Corrections Corporation of America) admitted in a 2010 report to its shareholders that “any changes with respect to drugs and controlled substances or illegal immigration could affect the number of persons arrested, convicted, and sentenced, thereby potentially reducing demand for correctional facilities to house them.”10 In other words, private prisons not only fail to save taxpayer money, they impede efforts to reduce mass incarceration and decrease costs to states in the future. People confined in private facilities are more likely to commit another crime after they’re released than those housed by the state. A study of Minnesota prisoners released between 2007 and 2009 found that people incarcerated in private prisons were 13 percent more likely to be arrested again, and 22 percent more likely to be convicted again compared to their counterparts released from state prisons. A study of Oklahoma prisons similarly found that imprisonment in a private facility increased the likelihood a person would go on to commit another crime after release by up to 17 percent. If privatization is touted as a way of improving performance, private prisons fail on the most basic measure of a prison’s effectiveness: rehabilitation. What explains the higher rates of recidivism among people held in private prisons? For one, because private prison corporations are interested in cutting costs in order to increase their profit margins, these facilities tend to offer fewer programs for prisoners. These services are crucial not only for occupying prisoners’ time during their incarceration but also for helping them address underlying mental health problems and learn skills they can put to use after release – making prisoners who receive them significantly less likely to reoffend. A Minnesota study found that 33.3 percent of prisoners in public prisons participated in general education classes, compared to 21.2 percent in private facilities. Similarly, 42.2 percent of prisoners housed by the state received treatment in chemical dependency programs, but only 9.1 of those in private facilities received these services. Additionally, ensuring prisoners have contact with their support system is crucial to curbing recidivism. One study of 7,000 people released from Florida prisons found that those receiving visitors were 31 percent less likely to commit another crime than those who did not. 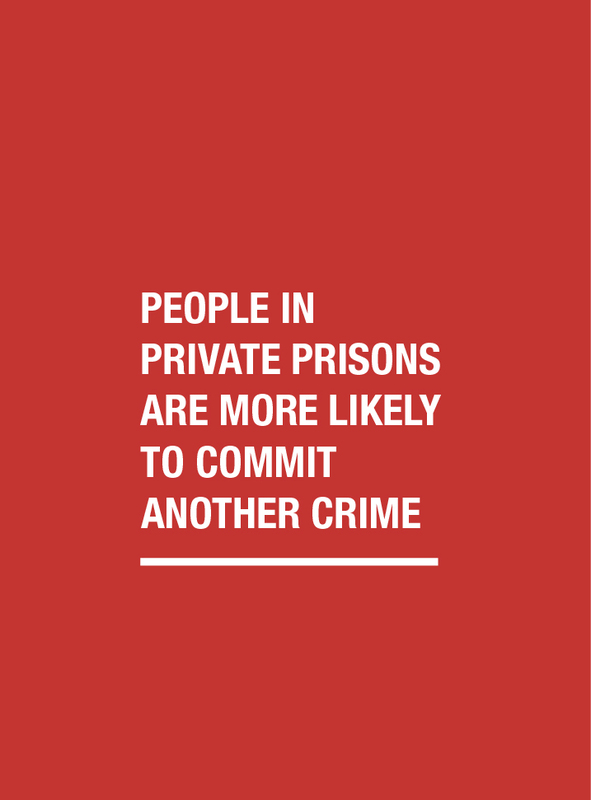 However, prison privatization can make it considerably more difficult for prisoners to see their friends and family. Looking to maximize their profits, private prisons sometimes contract out unused beds– using private companies like JailBedSpace.com – sending prisoners across state lines and far away from their social networks. Cutting staffing costs is the primary strategy private prisons use to lower costs – leading to lower wages, poorly trained staff, chronic understaffing, and high turnover. As a result, both staff and prisoners face a greater risk of violence, while the latter receive lower- quality rehabilitative care. The Alabama prison system – which is the most overcrowded in the nation and faces a profound staffing crisis – already confronts countless obstacles. Indeed, conditions are so egregious that the U.S. Department of Justice launched an unprecedented investigation into the state’s prisons in 2016. That investigation is still ongoing, but only months after its launch a federal judge deemed mental health care in Alabama’s prisons “horrendously inadequate.” The ruling, the result of an SPLC lawsuit, referred to the broken mental health care system as a driving force behind the “skyrocketing suicide rate” among the state’s prisoners and pointed to understaffing as a contributing factor. Some of Alabama’s prisons are already the most violent in the country; one corrections expert said the frequency of life-threatening assaults at the St. Clair Correctional Facility was the highest he had seen in his 43-year career. Privatizing Alabama prisons would likely only exacerbate these existing staffing and safety issues. With 65 to 70 percent of prison operating costs going toward staff salaries, benefits, and overtime, private prison corporations first look to these expenditures to cut costs. In 2015, the U.S. Bureau of Labor statistics found that correctional officers in private facilities made $7,000 less per year than those who were public employees. Private prisons also hire fewer corrections officers – resulting in an average of 6.9 prisoners per officer in private prisons as compared to 5 per officer in facilities owned by the state – and are less inclined to fill staff vacancies. In Tennessee, for instance, public prisons in 2016 reported a vacancy rate of 11 percent compared to a rate of 18.6 rate for privately operated prisons. As a result of poor working conditions, turnover rates in private prisons are extremely high. A 2008 Texas study reported a 90 percent turnover rate for the state’s seven private prisons, whereas the rate for public facilities was 24 percent. Similarly, a 2002 nationwide study found a staff turnover rate of 52.2 percent in private prisons as compared to 16.6 percent in those run by the government. Private prison personnel tend to be inexperienced as a result: A report from the Arizona Department of Corrections examining the 2010 escape of three prisoners from the private Kingman Arizona State Prison found that the staff was “fairly ‘green’” and that roughly one-third of security staff members had held their position for less than three months. An overwhelmed and undertrained staff compromises everyone’s safety. According to a recent Department of Justice report, in private facilities these factors lead to more frequent incidents of assault, uses of force, lockdowns, and discoveries of contraband. State-level studies report similar findings. In 2007, written testimony presented to the Texas Senate Criminal Justice Committee reported 65 percent more inmate-on-inmate assaults and 49 percent more inmate-on-staff assaults in private facilities as compared to comparable public ones, while a later study in Idaho showed prisoners were twice as likely to be assaulted in private rather than public facilities. Private prisons also perpetuate the racial disparities that plague the criminal justice system. Because people of color are substantially overrepresented in for-profit prisons relative to those that are state- owned, they are more likely to be subjected to the poorer conditions found in these facilities. This is the result of carefully devised contracts that allow private prisons to select less-costly younger, healthier prisoners who – because of the increased targeting of minority communities after the 1970s – are more likely to be people of color. In California, for example, people of color represent 76 percent of the public prison population but 89 percent of the population of private facilities. In Oklahoma, four prisoners died after a 2015 altercation in a medium-security facility run by CCA (now CoreCivic). A lawsuit filed on behalf of one of the deceased claimed that the fight was a result of staff negligence. Prison employees allegedly allowed contraband and encouraged competition in drug trafficking among prisoners. In 2015, Arizona ended its contract with the private prison operator Management & Training Corp. after a riot at Kingman Arizona State Prison left 16 people injured. A report found that the for-profit corporation failed to properly train its staff or to “promptly and effectively quell the riots.” Three people escaped from the same facility in 2010. A 2017 audit of Florida’s Gadsden Correctional Facility, operated by Management & Training Corp., found that the company deprived prisoners of heat and hot water for months in order to cut costs. With these poor oversight mechanisms, states have had trouble negotiating fair contracts with the corporations that run private prisons. In Florida, for instance, it took the work of a forensic auditor to uncover the fact that private prison vendors were relying on excessive cost estimates in order to ensure the appearance of savings. In 2011, for instance, the governor’s office promised that the private contractor running six work-release programs would save the state $550,000 annually. In reality, the contract resulted in a loss of $3.3 million over the next three years. The lack of accountability also prevents states from enforcing contracts with private prisons. In New Mexico, legislators believed both GEO and CCA (now CoreCivic) prisons had allowed staffing vacancies to exceed the 10 percent threshold dictated in their contracts, but – due to spotty record-keeping– the state corrections agency couldn’t decisively verify that the companies were in violation of the provision. When the state ordered the Office of Inspector General to monitor the contracts, however, the state proved to be correct and the two corporations were fined more than $1 million. Private prisons are not the answer for Alabama. Focused solely on profits, they are incentivized to act completely counter to what the state’s troubled prison system needs. If the governor and legislators want to reform our broken prison system, they must focus on solutions that reduce overcrowding and create an efficient, humane system that truly rehabilitates prisoners, reduces recidivism and makes our communities safer. Researchers have consistently found that longer prison terms are not better at changing criminal behavior than shorter terms. Policymakers must back measures that eliminate needlessly harsh sentences. They must also reform policies that keep prisoners incarcerated long after they are no longer a danger due to age or health. Drug and mental health courts confront underlying causes of crime and reduce recidivism. Alabama should spend more on public education, treatment and intervention rather than continued spending on incarceration and harsh sanctions. A key to reducing recidivism is eliminating obstacles that make it difficult for formerly incarcerated individuals to successfully return to their communities after release. Alabama must reform laws that make it difficult for people to get a job, find housing and access basic services due to their convictions. Ensuring safety means attracting and retaining highly skilled and experienced prison staffers by offering adequate pay and benefits. Prisoners must receive appropriate medical and mental health care in a timely manner. Public officials should ask if the money being spent today will have lasting benefits, such as improving public safety, reducing the prison population, ensuring safer prisons and discouraging recidivism. Private prison companies, which depend on keeping prison cells full to sustain their business, are not such an investment.